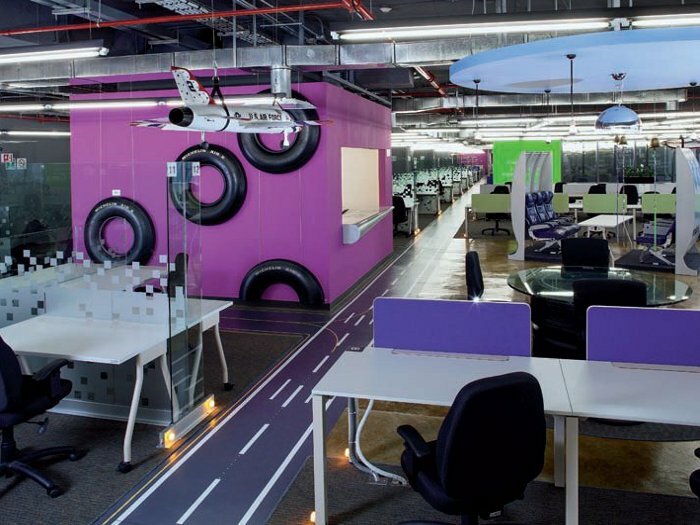 An ambitious brief coupled with a tight budget meant architecture practice SPACE had to rely on all its creativity and ingenuity when it came to designing this aviation-themed office for Mexican airline Volaris. But as SPACE founder Juan Carlos Baumgartner explains, sometimes it's the clients with the least money to spend that are the most rewarding to work with. For the new HQ, which takes up two floors of the newly built Diametro Arquitectos-designed Samara building in Santa Fe, Volaris wanted an office that would wow visitors - but more important was the ambition to create a workplace that would help create a happy and therefore more productive, workforce. Collaborative, open-plan work areas with a range of meeting areas - from private rooms of various sizes to more informal touch-down areas - were planned to give staff greater choice as to where and when they could get together. 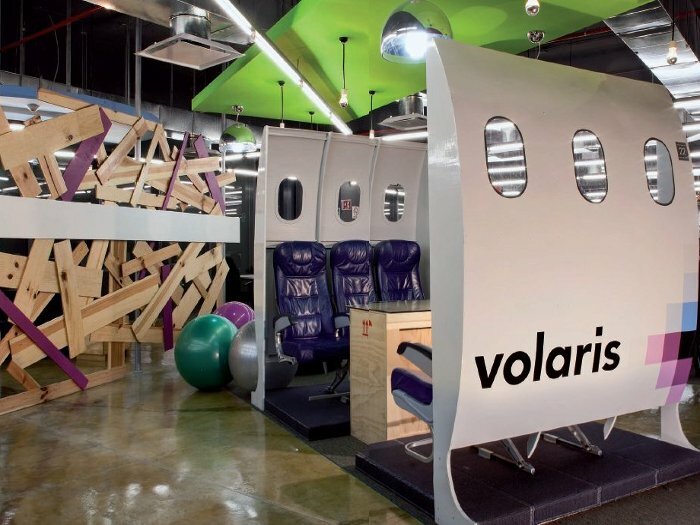 Baumgartner says Volaris's previous office was generic and bland, giving little clue as to the nature of the company's work, and a key aspect of the brief was to inject some of Volaris's 'character' and 'personality' into the new office. This is something of a speciality for SPACE. In this case SPACE used a deck of cards - each representing a different quality and asked Volaris's CEO Enrique Beltranena to choose which ones best described the way the company works and the way it wants to work. 'Empathy' , 'fun' , 'play' and 'relax' were selected, then the designers set about representing these in the new design and layout, creating an office that doesn't feel too serious, and has plenty of flexibility for staff to play and relax. 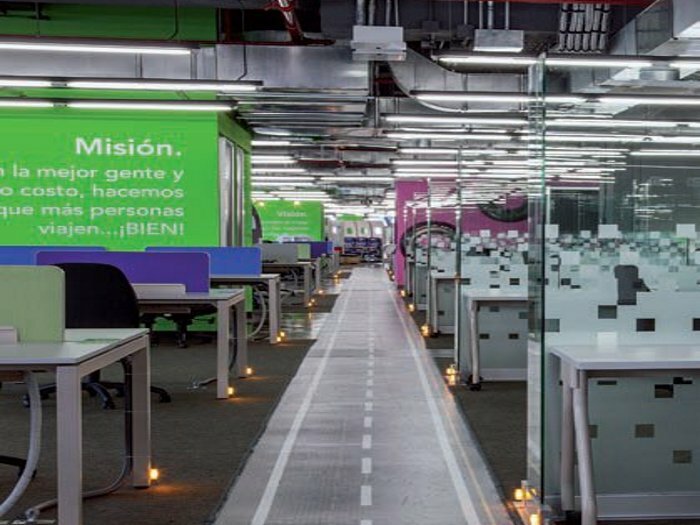 As well as being shaped by the company's character, Volaris also wanted its new workplace to represent the nature of its business. Baumgartner and the team decided to go full throttle on the aviation theme, hanging model aeroplanes borrowed from what he says is one the largest model plane collections in Latin America throughout the office; a runway style floor complete with landing lights runs between the desks. SPACE also used the real thing, plundering Volaris's stock of used aeroplane parts and reusing them as furniture. 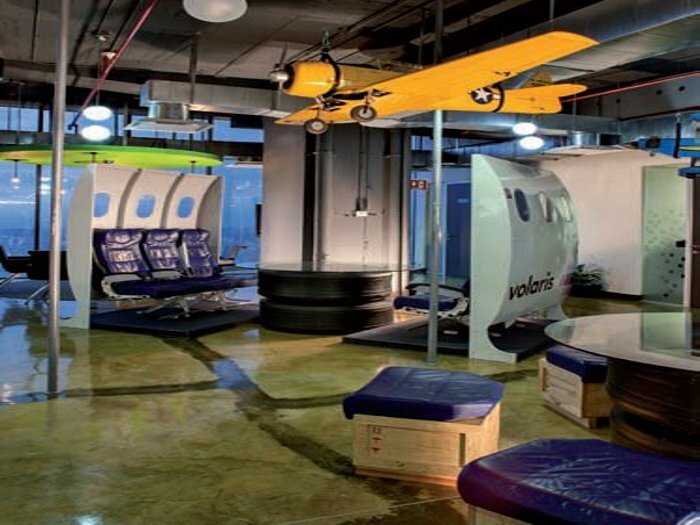 Informal meeting areas are made from cutaway sections of aircraft fuselages complete with original seats, while tables are created from aircraft tyres stacked on top of each other and topped with glass. Stools are made of wooden crates, used to transport aircraft parts, topped with aircraft padded blue seats. These informal meeting areas were a cost-effective way for the designers to make a bold statement; but along with other more traditional meeting rooms, they have also significantly improved the way Volaris works, says Baumgartner. A bright colour scheme is taken mainly from the Volaris logo, a Greek cross made up of coloured pixels of blue, purple and green. The exterior walls of several enclosed meeting rooms are painted in these colours, as are acoustic ceiling rafts. The pixels of the logo also make frequent appearances in the scheme, are manifested on glass partitions and used to create a level of privacy in the enclosed meeting rooms. Much of the furniture in the office is bespoke, with the rest of the ready-made pieces such as desks and chairs chosen for practicality and simplicity of form. But it is the use of recycled airplane furniture that really makes this office stand out - and Baumgartner agrees thinks this is the most successful aspect of the project. 'It's an interesting, low-tech approach to sustainable design: rather than using items with recycled materials, we are actually reusing items that would otherwise have been thrown away,' he says.